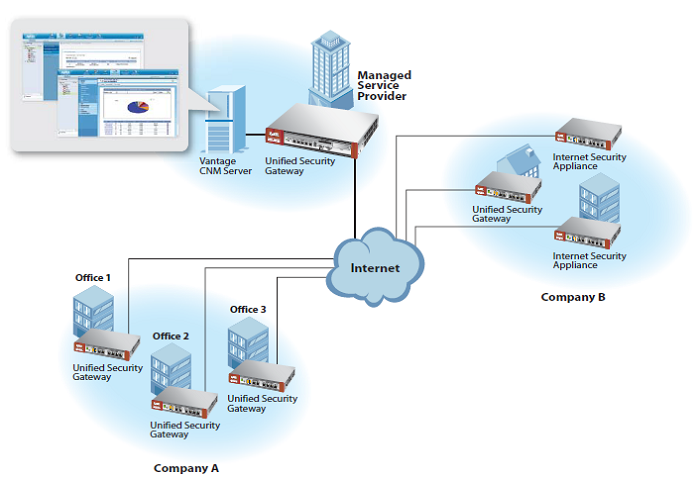 Vantage Centralised Network Management (CNM) is browser-based management tool for service providers and IT staff. Distributed network components can be configured, analysed and supervised centrally. This “management head office” makes it easer to get an overview of network activities and increases the efficiency of stand-by services. Zyxel Vantage CNM is a centralized management solution that enables IT managers to administer ZyWALL Unified Security Gateway (USG) Series. The design of VPN management helps reducing time, costs and complexity involved in VPN configurations. Network administrators can easily create VPN networks and change VPN parameters (e.g. pre-shared key, gateway IP and ID, etc.) across multiple devices in the community, and this feature also avoids the configuration hassle as well as potential human error. The VPN monitoring function allows network administrators to actively monitor VPN tunnel status and troubleshoot VPN problems with the diagnostic tools. The Vantage CNM provides a single integrated management interface that allows all devices to be controlled from a centralized location. Through the centralized console, network administrators can easily manage UTM services for subscription, update and status monitoring. Active license expiration notification can be generated automatically to remind administrators and customers for renew, while security policies are carefully enforced and management complexity decreased. Network attacks and threats are easily identified through dashboard; useful comprehensive reports and the drill-down capability also help administrator to analyze attack sources and trends. The Vantage CNM provides quick configuration to a single device or a group of devices to improve management efficiency and reduce overhead for massive deployments. It allows administrators to conduct firmware upgrade for multiple devices and to minimize end user service disruption with the scheduling option. The device settings can be saved and restored on a regular basis or on demand, and the group operation design reduces administrator efforts of network maintenance. 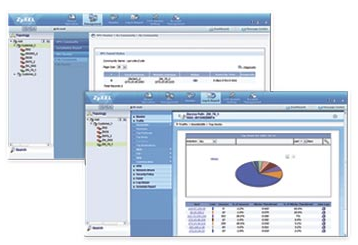 Taking advantage of CNM, administers can even display and sort the statuses (online, offline, alarm or on scheduled tasks) of numerous ZyWALL through actively monitoring the devices. The centralized logging feature of the Vantage CNM allows administrators to analyze device logs from a single console, and it provides many useful predefined templates including network traffic, network attack, VPN usage, Web usage and security policy reports for the management to analyze network and user behavior easily. Automatic daily/weekly scheduled reports can be generated, while customizable report templates allow MSP to provide customized reports for their customers. Download the Zyxel Vantage CNM Datasheet (PDF).